General Krapfang eyed the sea with a sour expression. "Gorblymee," he observed, "It shur looks wet." He stood on a low promontory, overlooking a long and desolate beach. Behind him, the remnants of his orc army were bivouacked among the dunes. The pursuing Skaven horde was only a day behind. 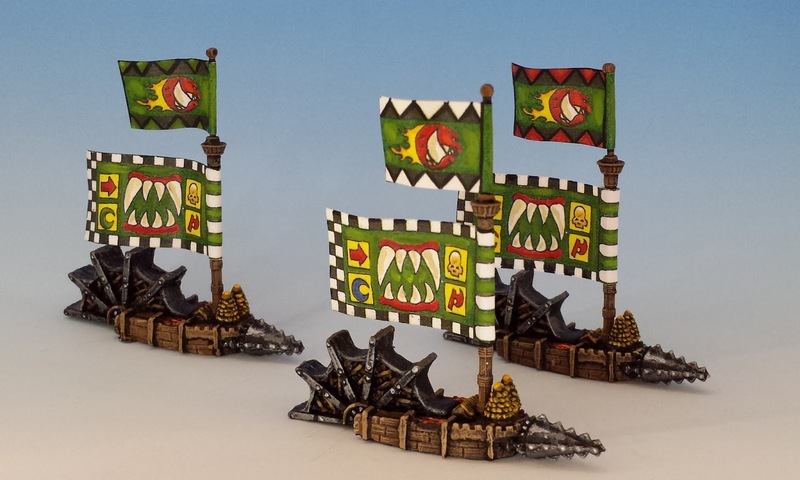 The ratmen had chased Krapfang and his troops for almost fifty leagues, apparently with the design of pushing them right off the edge of the Black Peninsula and into the sea. The wet, wet sea. "Git dat fire blazen, boyz," said Krapfang. There were no trees on this awful spit, so he had ordered the Man-Mangler to be broken up with axes for fuel. The engineers had protested, so he ordered them broken up with axes too. "Da Mangler can't 'elp urse where's weez gota go." Krapfant knew that his only hope lay in kindling a signal fire big enough to attract the great orc pirate, Commodore Stonker Flegmaticus. Orcs do not take naturally to the sea. The naval historians of Marienburg have theorized that the first orc ship was in fact a poorly constructed wooden keep that was swept into the Sea of Claws by a flash flood. 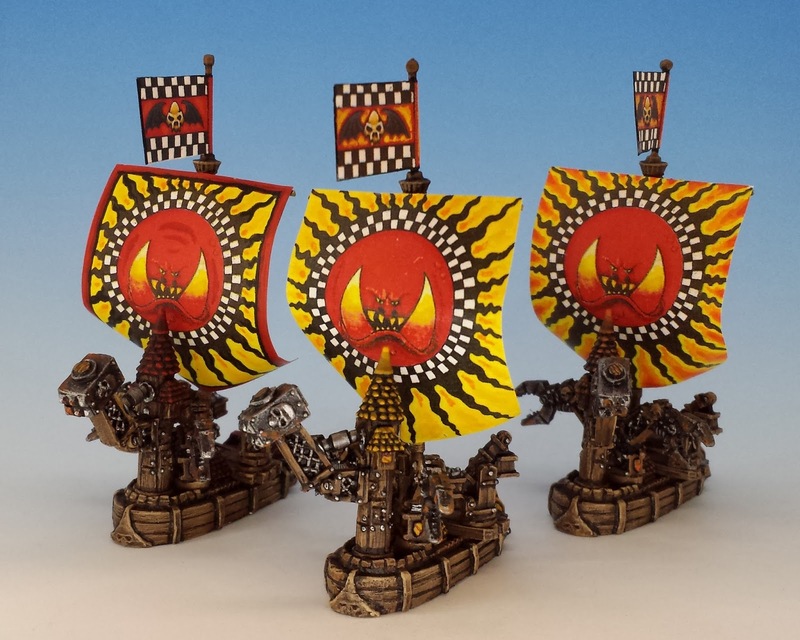 Indeed, the orcs seemed to have walked backwards into several important naval innovations. So, for example, their use of boiler engines arose from the simple fact that orcs enjoy burning coal because the fumes and soot relax them. It was left to a dwarven prisoner aboard one vessel to point out to his orc captors that the coal furnace was not merely a recreational device, but could be used as a form of propulsion. A true passion for the sea was only lit in the orcs once they noticed that every time they built a ship, some officious elf or human would try to sink it. With surprise and delight, orcs realized that naval combat is significantly more violent than land battles; loud noises, lots of war-machines and ramming are the order of the day. Boarding involved claustrophobic melees, "like a knife-fight in a barrel" (to quote one early orc admiral). And once a boarding action was joined, there was nowhere for anyone to run. In a theological sense, this is the orcish definition of paradise. Amid the various orc sea-masters who have terrorized the Old World, none are as feared as Commodore Stonker Flegmaticus. He has rampaged from Erengrad to Araby, raiding ports, seizing slaves and sinking fleets. His tactical genius is a byword. He was the first to note that, in a pinch, a drunk dwarf can be fired from a catapult as an incendiary missile. And at the Battle of Bilbali, it was Flegmaticus who sank the Estalian flagship by ordering grapples to be thrown at the top of its mast, allowing an orc Hulk to tip the vessel over in a hideous tug of war. Krapfang's wizard, Grogeye, had advised him that Flegmaticus was pirating around the Black Gulf. A naval evacuation was now Krapfang's only hope. Surely the Commodore would be looking for a few good marines. And surely he would have heard of Krapfang's exploits... that is to say, his successful exploits. They would meet as peers. Surely. Maybe it would all work out... after all, could it get worse? The flagship of Commodore Stonker Flegmaticus, "The Grunder"
I hope we hear more tales from Flegmaticus and his newly press ganged crew. Only ever played a few games but they were great fun. Nice paint jobs here! 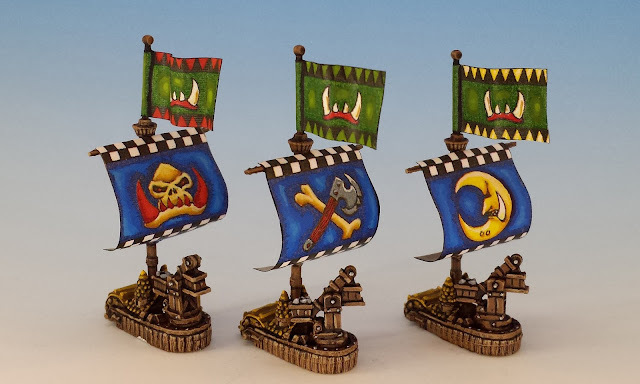 Great paint jobs on those tiny little ships. I never played the game either, but the variety of warships etcetera for it looked impressive. 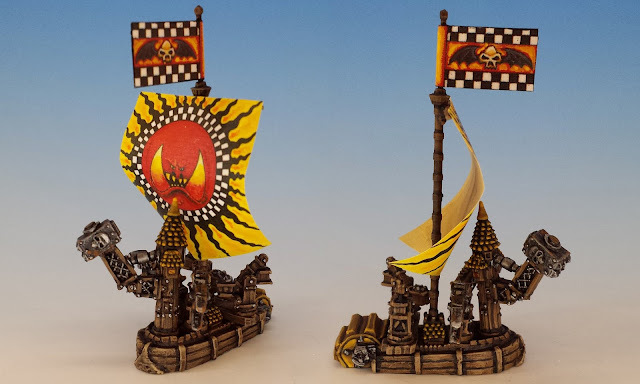 Absolutely fantastic paintjobs sully, the sails especially the sails; your freehand is stunning! I love the narrative, however as I recall our last game ended with my teeth thoroughly kicked down my throat. Vengeance is mine, I demand satisfaction! I wish I could say that all those sails are my free-hand. They're mainly paper sails printed in the original box sets. I just painted on highlighting, some colour correction and better black outlining. You will get your revenge soon! The miniatures look fantastic. 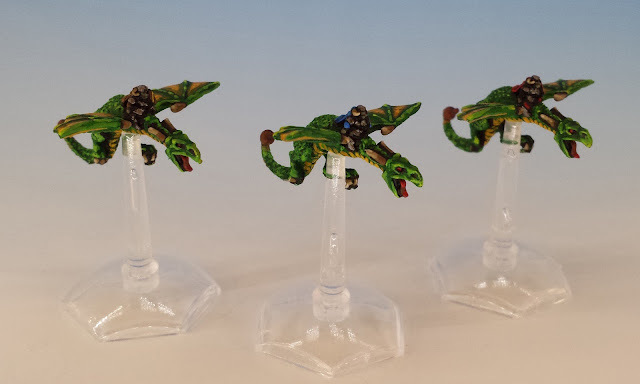 I especially like the wyverns. The highest praise I can bestow is that this looks and reads like a White Dwarf article from 1992! Brill writing and gorgeous ships, good job!